Located in Wayne, Pennsylvania, Chanticleer Botanical Garden is a 47-acre public garden facility located on the former grounds of the estate of pharmaceutical manufacturer Adolf G. Rosengarten, offering a variety of landscaped gardens and open lawn space for public relaxation. The Chanticleer estate was originally constructed in 1912 as the summer home for the family of Adolph G. Rosengarten, the owner of the Philadelphia-based Rosengarten and Sons pharmaceutical company. Founded in 1822, Rosengarten and Sons originally formed as a company for the production of quinine and became a major pharmaceutical distributor on the American East Coast before merging with Merck in 1927. Due to the large number of rooster carvings and references throughout the estate, including a carved stone crest on its entrance gate, Chanticleer was named after the French word for rooster. In 1984, the Chanticleer property was listed on the National Register of Historic Places. After inheriting his parents’ estate upon their deaths, Adolph G. Rosengarten, Jr. set out with a vision to develop the property into a public garden space, hiring British landscape designer Christopher Woods to create botanical gardens on the property’s grounds. Following Rosengarten, Jr.’s death in 1990, Woods was appointed as the facility’s Executive Director and developed the facility further according to a master plan, tearing down the estate’s stone house for further landscaping purposes. In 1993, Chanticleer was completed and opened to the public. Today, Chanticleer spans more than 47 acres, offering more than 35 acres of public garden and relaxation space, open seasonally between April and October. It is owned and operated by the Chanticleer Foundation, which employs seven horticulturalists to oversee the development, creative direction, and maintenance of each individual section of the gardens. As a botanical garden facility, Chanticleer has been celebrated as one of the most innovative and imaginative public garden facilities in the United States, utilizing a variety of textures, forms, and sculptural elements to create unique public park spaces. Chanticleer’s gardens include a variety of open lawn spaces, tree-lined areas, and landscaped botanical gardens, focusing on creative, environmentally-sustainable landscape designs. The original Chanticleer House is preserved, open to the public for guided tours by appointment. The home’s open-air sun porch is open to the public with admission to the gardens, serving as a link between the home and garden spaces and showcasing a small garden of pink cherry, hydrangea, and phlox beds along a red gravel circle and a small area of bear’s breeches, purple gas plants, and Grosso lavender plantings. A swimming pool, several small fountain sculptures, and a public entertainment lawn are also offered as part of the house’s grounds. The facility’s Teacup Garden serves as the property’s entrance courtyard area, showcasing an Italianate fountain and seasonal tropical plants such as bananas, gingers, pineapple lilies, apricot devils, and succulents. A mile-long circular main path connects the facility’s other gardens, which are accessible from the main house via an elevated walkway with two viewing platforms. At the end of the walkway, a Serpentine Garden living sculpture is constructed of juniper and ginkgo trees, evoking pagan natural imagery. A hillside Bulb Meadow contains displays of daffodils, Spanish bluebells, autumn colchicum, and naked ladies, while an Asian Woods area was developed in 1995 as a woodland dedicated to native Chinese, Japanese, and Korean plant species. Several traditional woodland areas are showcased throughout the facility, including the Minder Woods stone pathway, which winds through red oak, green pine, fir, cypress, and hemlock plantings, and Bell’s Woodland, which connects to the Bell’s Run Creek and waterwheel. A Pond Garden, originally constructed in the 1970s, showcases ornamental grasses, daisies, and black-eyed susans, serving as an ecosystem for herons, frogs, and hummingbirds. The facility’s Ruin Garden uses the ruins of the estate’s Minder House as its foundation, divided into three landscaped garden “rooms,” including a Great Hall, a Library, and a Pool Room. 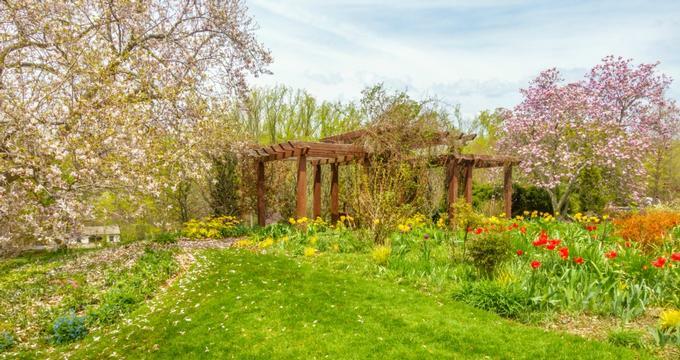 The estate’s former tennis court facilities have also been transformed into a Tennis Court Garden, showcasing summer and fall herbaceous plants in five beds, and a Cutting Garden uses the facility’s cottage to create a traditional four-quadrant garden with arches. Other gardens on the facility include an American-style Vegetable Garden, a Gravel Garden showcasing rare native plants, and an open Orchard lawn. Guided tours of the Chanticleer House are offered seasonally by appointment for small groups and organizations, lasting approximately 90 minutes. A variety of educational programming is offered by the facility, including art and horticulture courses and workshops offered in conjunction with the Pennsylvania Horticultural Society, the Philadelphia Society of Botanical Illustrators, and the Wayne and Main Line Art Centers. Several internship and scholarship programs are offered, including a Chanticleer USA Christopher Lloyd Scholarship, which provides an opportunity for horticulturalists to study at Great Dixter in East Sussex, England. Chanticleer is also the host of the annual Perennial Plant Conference, held at nearby Swarthmore College.